- One of the world's most top locations for photographing wildlife. - Luxury accommodations that is thoughtfully planed for prime wildlife photography. - Price includes bush plane airfare on our last day in the bush back to Arusha. - World class Guides that understand animal behavior and how best to capture winning images. - Photo instruction based on your experience and needs from International wildlife photographer, Barbara Fleming. - You will leave a better wildlife photographer! The Serengeti, which means "The Endless Plains," is one of the very best wildlife viewing destinations in the world. The big cats of Africa: lion, leopard and cheetah all live and hunt here. Our best trackers will help us locate these big cats and photograph them: hopefully seeing them with their young and watch them stalk their prey. While our safari will concentrate on the big cats, we will also be able to see and photograph the other wildlife that make this savanna home. At this time of year The Migration (wildebeest and zebra) is located nearby with thousands and thousands of individuals as well as year round residents: hippos, elephant, giraffe, and over 500 species of birds which will not be ignored. April in the Serengeti is a time of new life and plenty of action as The Migration lingers in the southern and central areas of the park so that the newborn animals can grow before making the long trek north toward Kenya. Our location for the entire time in the park will be close at hand. 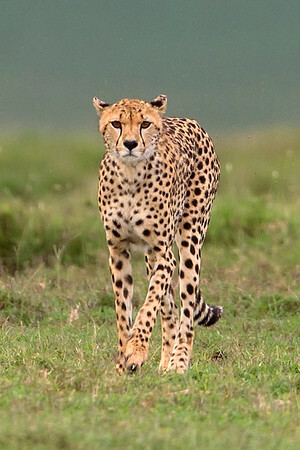 The lion, leopard and cheetah do not travel with the migration but stake out a range that is prime for their unique hunting styles and to take advantage of The Migration when it is in the area. If you love wildlife photography there are not many locations in the world that can compare to that of the Serengeti in Tanzania. You will see everything you ever dreamed of seeing on a safari, and perhaps even more. The lodging is chosen specifically so that we can be where the wildlife is and have the ability to get there at first light. The camp is designed with photographers in mind and has everything the photographer would need, particularly electricity to charge batteries and computers. The food is safe and delicious and the camp staff is always ready with a warm smile and willingness to assist with every need. Our African Outfitter uses 4 x 4 Vehicles that have separate roof dividers so that each photographer can rest their beanbags and cameras. Each vehicle is equipped with a cooler with soft drinks and plenty of water. With only three photographers per vehicle you will have your own row, enabling you full access to the action with plenty of room for your gear. We strive for safety, comfort and optimal photographic opportunities. 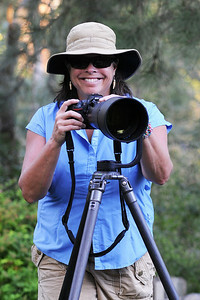 Barbara, your safari leader, has over ten years of experience traveling and photographing in this area. She knows where to look for the wildlife, how best to photograph it and most importantly, how to work with the African ground outfitters. She has made many friends over the years who are dear to her heart. In the Serengeti she is known as Mama Serengeti. Our trip of 9 days and 8 nights will begin in Arusha, Tanzania, where you will be greeted at the Kilimanjaro International airport (JRO) and transferred to the Arusha Coffee Lodge, about 45 minutes away. We will depart the following morning by vehicle to our first location, Ngorongoro Crater. For each day for the next 8 days, our plans will be roughly the same: an early morning and late afternoon game drive, when light is at it's best and the animals are most active. We will depart our camp following a hot breakfast at 6 am and return some days for a lunch. Other days we will choose to stay out and take box lunches. Following time spent uploading and critiquing images or having a small rest, we again leave for an afternoon game drive, returning at 6 pm. We reserve the right to change this itinerary if needed to stay with the action. As always, you will have a say as to what our day will consist of. Upon arrival we will be transferred from the airport to the Arusha Coffee Lodge, hidden amongst one of Tanzania’s largest coffee plantations, in Arusha. We will have our first meal (dinner) upon arrival and breakfast the next morning before departing for the bush. On our last day we will return to the lodge for dayroom use before departing for our evening flights home. Following breakfast we will depart for the Ngorongoro Crater, approximately 3 hours drive. We travel through a mix of urban, pastoral and agricultural Maasai land arriving in time to photograph in the Ngorongoro Crater, a magical beginning to our Serengeti experience. Our lodging for the next two nights will be Ngorongoro Sopa Lodge, located on the rim of the crater. Our next location is Ndutu, part of the Ngorongoro Conservation Area, where we will be for four days. Ndutu is known for it's off-road driving, essential for wildlife photographers who need the freedom to situation the vehicle in the best light. This is also world class cheetah country - It has never failed it's ability to provide excellent cheetah and lion photography. Along with incredible bird opportunities, it is a favorite location for many on the trip. Our lodging will be Lake Ndutu Luxury Tented Lodge. We leave Ndutu for the expanse of Serengeti National Park, staying and photographing for the next two nights at a private luxury tented camp, Sametu Camp. The camp is again located for excellent wildlife photography and often we will encounter lion and leopard on our way out each morning. This itinerary has been created for this specific time of year. Arrival at Arusha's Kilimanjaro International Airport (JRO). Everyone will be met upon arrival and accompanied by our African Outfitter staff. We will transfer about 45 minutes to our lodging, Arusha Coffee Lodge, in town for an orientation dinner and overnight stay. Following breakfast, we will travel by private vehicle approximately 3 hours to Ngorongoro Crater where we begin our photographic safari. Ngorongoro Crater, the largest intact caldera in the world, is home to almost every species found in the Serengeti. It will be our best bet to see and photograph the highly endangered black rhino. Our lodging for the next two nights is Ngorongoro Sopa Lodge located on the edge of the Crater wall and situated for the best access for early morning entry into the crater, essential for photographers. Departing with a packed lunch after breakfast, we make our way to Ndutu, located on the southern edge of Serengeti National Park. We will have an afternoon game drive before checking into our next tented camp, Lake Ndutu Luxury Tented Lodge. The area is filled full of large predators to include lions, leopard and cheetah and we will hav plenty of action for us to photograph. We can also go off-road which allows up optimal opportunity to capture the animals in the very best angle with the best light. Day 7-8 April 13-14 Leaving the Ndutu conservation area, we set out to Serengeti National Park and drive to the park proper through Naabi Hill Gate, continuing on to the Seronera River Valley. This area has excellent habitats for leopard and large prides of lion. We also explore the more remote areas around our private tented camp, Sametu Camp, with first light giving us incredible photographic opportunities. Plenty of adventure awaits us. Day 9 April 15 One last early morning game drive before departing from the Seronera airstrip to fly back to Arusha. We have time for shopping at the nearby Cultural Heritage Center and then on to the Arusha Coffee Lodge for lunch. Dayroom at The Country Inn for showers and repacking before departing to the airport for flights home. Pre-tour documentation and Safari Handbook including extensive travel information to help you prepare for your trip. Flying Doctors services while on safari. Phone calls, internet, and laundry. Please enter your information below. To complete your secure payment, you will be directed to PayPal.